Alex De Minaur celebrates after defeating Fernando Verdasco at the Sydney International. AUSSIE teen sensation Alex De Minaur has picked up where he left off in Brisbane with a straight sets demolition of former world No. 7 Fernando Verdasco in the first round of the Sydney International. There was no sign of a let-down after his giant-killing form of last week and he now faces seventh seed and world No. 30 Damir Dzumhur in the second round. "I feel like I'm riding this wave," De Minaur said of his 6-4 6-2 win. "I'm playing great tennis and I don't want it to stop." Australian tennis fans certainly feel the same and regardless of how he progresses in Sydney this week he has marked himself as one of the players to watch in next week's Australian Open in Melbourne. 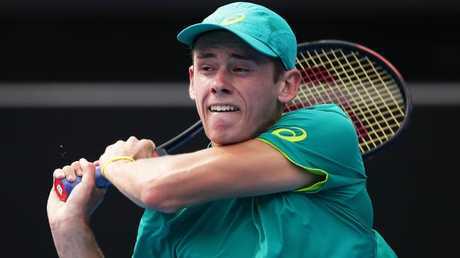 Alex De Minaur has marked himself as one of the players to watch in the Australian Open. He is being mentored by Australian Davis Cup captain Lleyton Hewitt and the results have been dramatic. "I did have a talk to him before my match as sort of every match," De Minaur said. "We talk about the game plan and what I wanted to achieve out there. You know, I went out there and executed. I'm very happy with myself." So he should be - the 18-year-old has improved 31 spots in the world rankings, rising from 208 to 167th in a week. His dramatic improvement has coincided with his association with the Davis Cup team over the last 12 months where he has worked as an 'orange boy' and hit-up partner. It is a similar apprenticeship which worked so well for Hewitt in the early part of his career. "I think it's been great for me to have that opportunity to be part of the Davis Cup squad," De Minaur said. "Every day I feel like it's a new opportunity to learn something, hanging out with those guys, you know, Nick, Jordan, Rusty, Stoltz, Rochey. It's just an unbelievable line-up. I cherish every moment I get with them, and I try to make the most out of it." 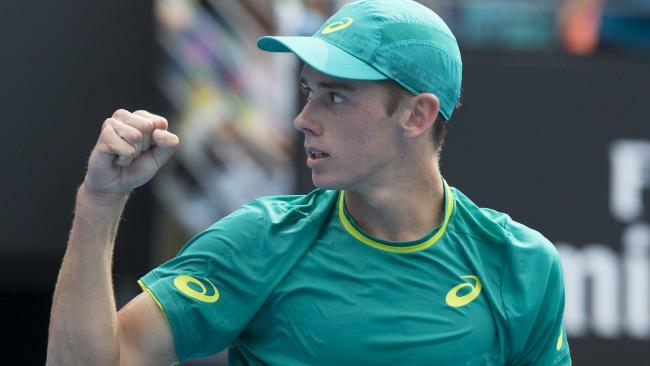 Alex De Minaur has worked with Australia’s Davis Cup team over the last 12 months. De Minaur was born in Sydney to a Spanish mother and a Uruguayan father and moved to Spain at the age of five before returning to live in Sydney in 2012. He spends his time between Australia and Spain but has declared his commitment to Australian tennis. "I have always been passionate for Australia," De Minaur said. "You know, it's what I have always wanted to do. Growing up, that's what I was looking up to, you know. Lleyton playing Davis Cup, that fire, that grit, that never giving up, that's what I want to get to one day, to be able to wear the green and gold and represent my country. I think there is no greater honour than to be able to do that."